This talk was given by Elisabeth Hendrickson. Elisabeth’s twitter handle is @testobsessed and I’d say that suites her entirely. She is obsessed with testing. That was pretty obvious. This was more a workshop than a talk so it was very interactive again. The idea here was to practice thinking about how to uncover tests suited to a given design by playing a game called scrabble flash. It worked well. As small groups, we were able to identify a few interesting test conditions just by trying different things with the game. This was another exercise where I’ve seen that a big part of software testing is about creating opportunities that fuel curiosity and creativity in the mind of the tester. I’m starting to think that we’re not quite curious enough in hardware testing. fwiw… if you’re looking for a scrabble flash partner, I’d go with Jon Kern. He’s a pro. Agile2xxx is a conference put on the Agile Alliance that has happened every year since 2003 (I think??). This year, roughly 1500 software developers from hither and yon will meet on August 8th at Agile2011 in Salt Lake City to hear colleagues speak, participate in workshops and discuss the next big things in software development. It’s not the only agile conference of the year but it’s a big one from what I understand. I’ve enjoyed the opportunities I’ve had to present at conferences. But more so than at other conferences, Agile2011 is a chance for an experience that’s quite different. Why you ask? Well at hardware conferences, I talk to my peers–people that do the same things I do (which is mainly hardware verification). Acceptance and feedback can be mixed, but people normally get the gist of what I’m talking about. Compare that to me speaking at Agile2011. 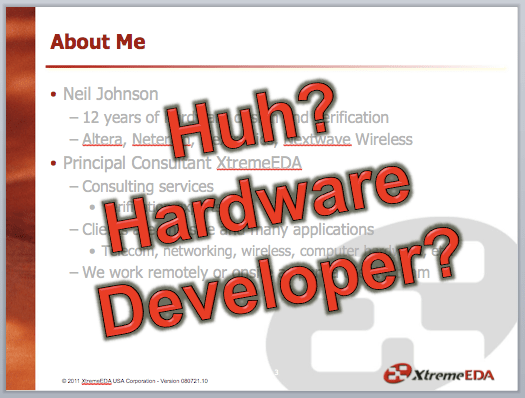 Agile2011 is a software conference… I’m a hardware guy. Attendees (I’m assuming ) are experienced with agile… me, experienced’ish. Presenters (again I’m assuming here) are experts with agile… me, not exactly. Hardly an exact fit. So why then would I submit a proposal? Admittedly, that was a last minute twitter-initiated decision. Compared to agile software experts, I’d consider myself a rookie. A very enthusiastic rookie with decent experience but a rookie nonetheless. I have a long list of ideas for what should work in hardware development. I’ve done small scale rollouts of some of those ideas that have turned out successful. I’ve put a lot of time into it and because I’ve already given presentations and written about what I’ve been doing on www.AgileSoC.com, I figured I could cobble together a proposal relatively quickly. The submission process was an interesting experience. I’ll get to that in the next entry (spoiler alert: I did submit a proposal and it was accepted). Back to the why… the first reason for me submitting a proposal to Agile2011 is to get expert opinions from others on what I think should work. 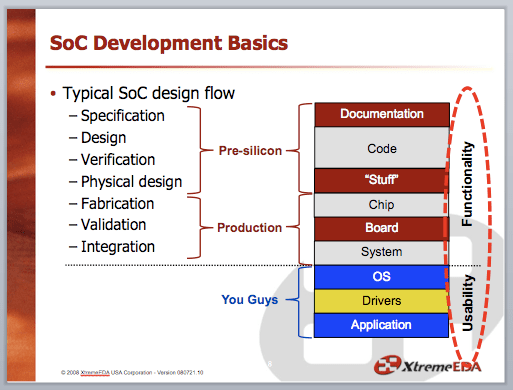 I’m convinced that agile can work in hardware development, even though it is relatively unknown. I’ve seen it work on a small scale. The software guys use it so successfully that it’s ridiculous to think that we can’t use some of what they’ve already shown to work. The obvious differences mean it can’t be exactly the same, but the obvious similarities mean it won’t be entirely different either. Presenting my thoughts to a conference crowd gets ideas heard, critiqued and (hopefully) validated. The second reason (which is where the title of the blog comes from) is that I actually intend to learn something from these strangers from the land of software! From the submission process to the preparation and the presentations, workshops, side discussions and everything else. It’s a different crowd and a different experience so I expect to be bombarded with great new ideas from a few different angles. Finally, I would hope software developers listening to me talk about agile in hardware development will get something out of it also. If I didn’t think I could pull that off there wouldn’t be much point in me presenting anything! Agile is big in the software community but relatively unheard of in the hardware community. I think AgileSoC.com has started to change that. I hope a presentation at Agile2011 is a good next step.